Random House Large Print, 9780593150849, 320pp. The bestselling author of The Miracle Morning shares the secret to unlocking your full potential—all day, every day. 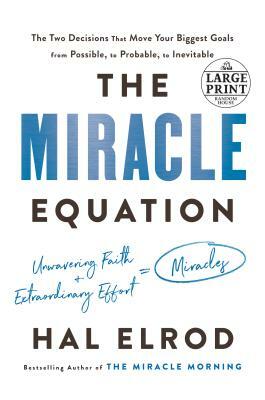 Even after the incredible success of his book The Miracle Morning, Hal Elrod realized that he still had more to share with the world. What he had discovered was a timeless but overlooked formula for success. The world’s top achievers have used it for centuries. He used it to thrive against seemingly insurmountable odds, from overcoming life-threatening health challenges to near financial collapse. And with the Miracle Equation 30-Day Challenge to guide your way, you’ll create a step-by-step plan to actualize your miracles and become the person you need to be in order to succeed. No goal is out of reach! HAL ELROD is on a mission to elevate the consciousness of humanity, one reader at a time. As the author of the international bestseller The Miracle Morning, as well as his newest book, The Miracle Equation, he is doing exactly that. After overcoming multiple near-death experiences and impacting millions of lives, he has dedicated his own life to showing others how to overcome their challenges so that they can fulfill the unlimited potential that is within each of us.